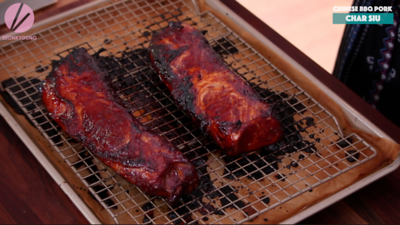 Today’s recipe is the BEST Char Siu, Chinese BBQ pork and I also will show you guys how to use them in 4 ways! 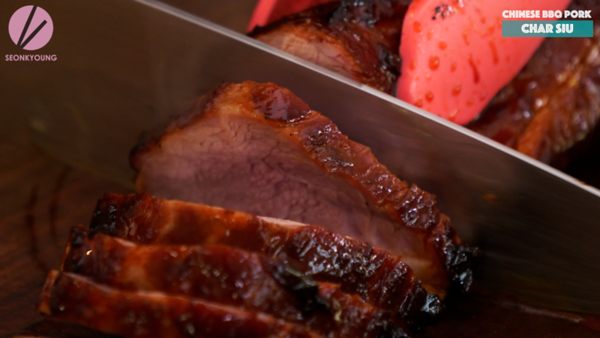 Obviously, there are more ways to enjoy the BEST Char Siu and this is just a little bit of example. It will be delicious in between steamed buns (Char Siu Bao!) as well! So be creative, and try however you think it will be delicious! 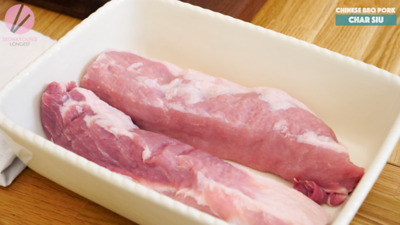 Cut pork loin in half in lengthwise and place in a baking dish or plastic bag. 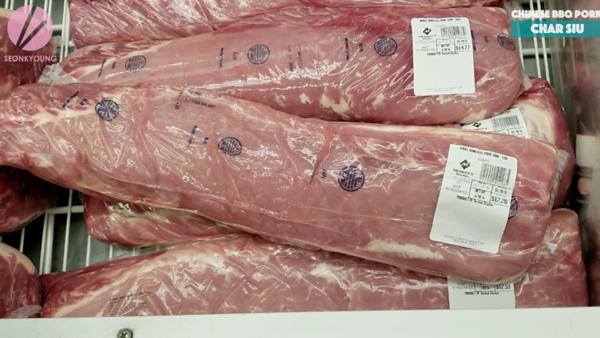 I got the pork loin from Sam’s Club and it was SUPER CHEAP!! 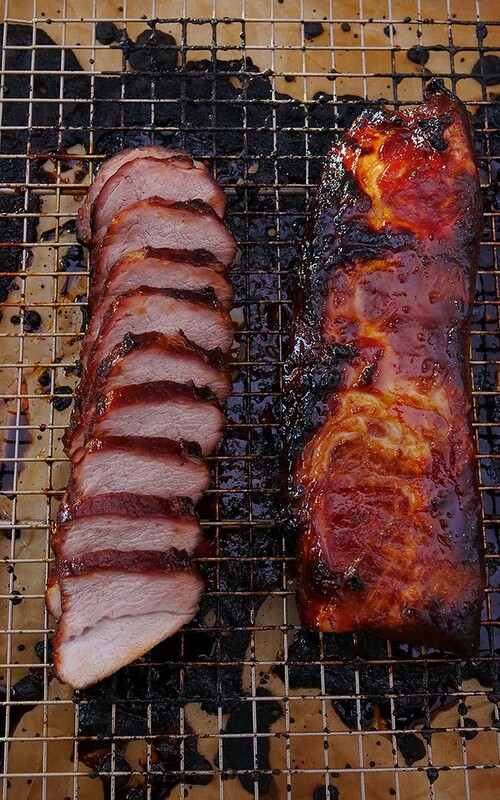 This size of pork loin will feed army and this Char Siu recipe so delicious you might need to double up the recipe and cook the whole thing! 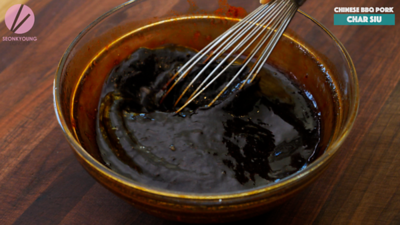 Combine soy sauce, dark soy sauce (for more deeper color), hoisin sauce, oyster sauce, shaoxing wine (Chinese cooking wine), honey and smoked paprika in a mixing bowl and whisk well until honey is completely dissolved. 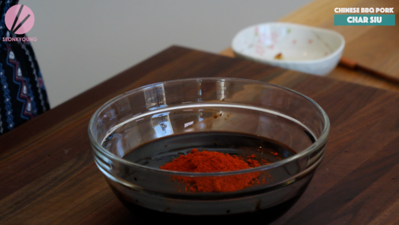 Traditional Char Siu needs red fermented beancurd for deep flavor and red color. 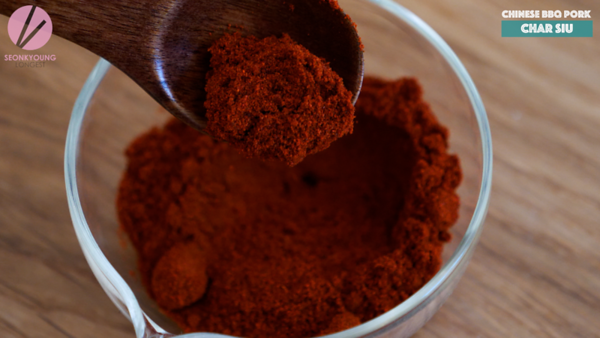 But I thought it might be a tricky ingredients for you guys to get, so I decided to release my secret with you all…. It will give the beautiful red color without using red coloring and it will give beautiful smokey aroma to the pork, which all BBQ needs. Pour the 3/4 of the marinade into the pork and move the pork around so it will sit in marinade evenly. Let it marinade at least 6 hours to 48 hours. 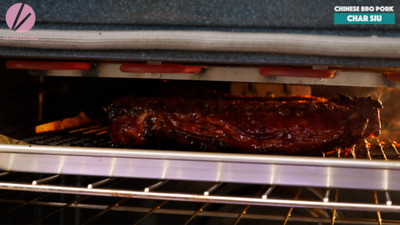 Preheat the oven to high broil (500F to 550F) for 10 to 15 minutes. 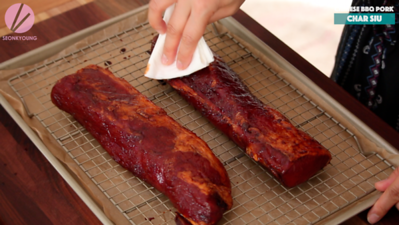 Place a parchment paper or aluminum foil and a rack on a large baking pan. 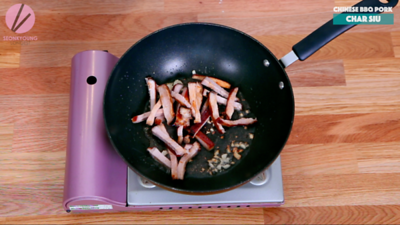 Place the marinated pork on top of the prepared baking pan and tap excess marinate with paper towel. 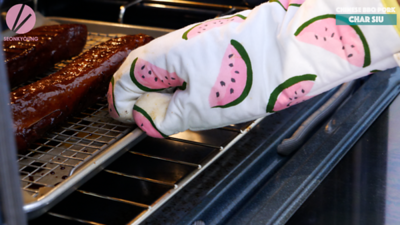 Broil the pork on the lowest rack of the oven for 10 to 12 minutes. 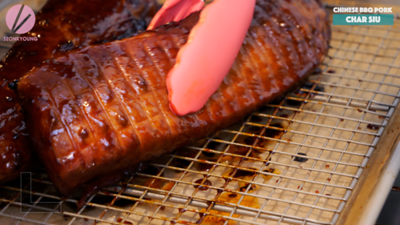 Meanwhile combine remaining marinade and honey to make a glaze. 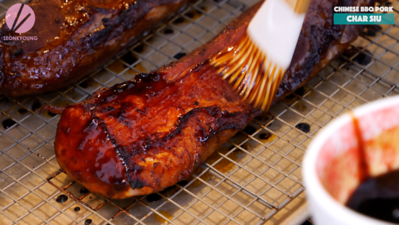 12 minutes up, now brush the glaze on the pork and flip it over. 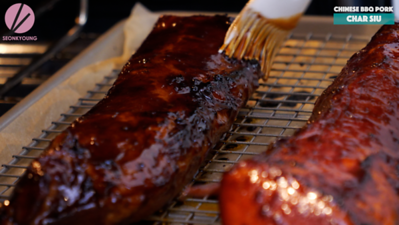 Glaze the other side too and broil another 10 to 12 minutes. 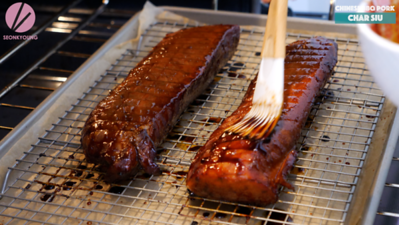 Brush the glaze once again and place the pork on the highest rack of the oven (closest to the broil) and let it caramelize for 2 to 3 minutes or until the inner temperature of the pork reaches to 145F. Remove from the broil and let it rest for 3 minutes. Brush with only honey for the extra shiny look and it’s done! Slice as you desire and enjoy by it self, on top of warm bowl of rice, ramen, noodles soup or in between steamed buns (bao). Leftovers will be great to make fried rice or fried noodles! It also can be a protein for your salad! Enjoy!! 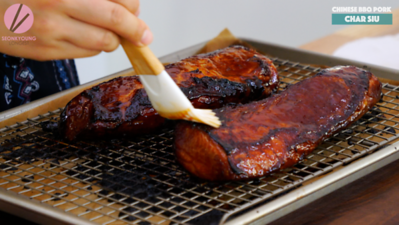 Now, let me show you how you can use the BEST Char Siu in your everyday meal! First, got to be ramen! 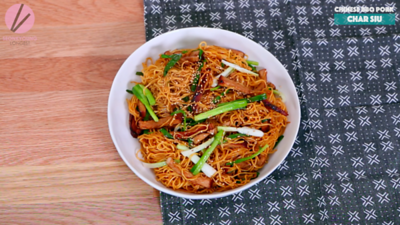 just cook your favorite ramen noodles and top with sliced char siu! 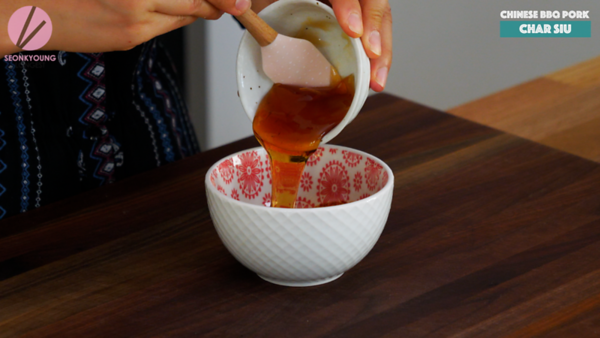 Put on top of warm cooked rice and pour some 1 Tbsp soy + 1 Tbsp honey mixture! Top it up with some chopped green onions and it will be so delicious!!! 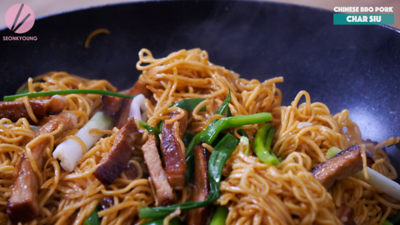 You can also make chow mein! 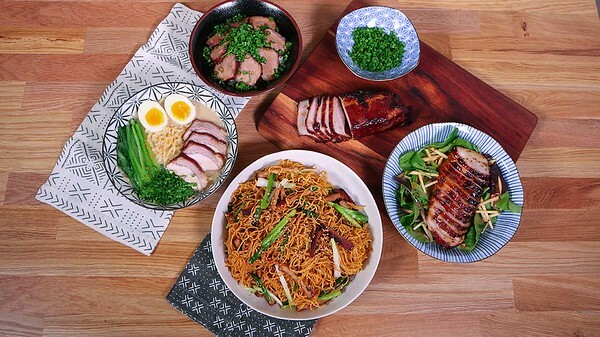 in 2 Tbsp oil, add 1 clove chopped garlic, some char siu, 6 oz pre-cooked egg noodles, 1/4 to 1/2 cup chicken stock and 2 Tbsp oyster sauce! Just stir fry away and finish with sesame oil and sesame seeds! Last is the easiest! 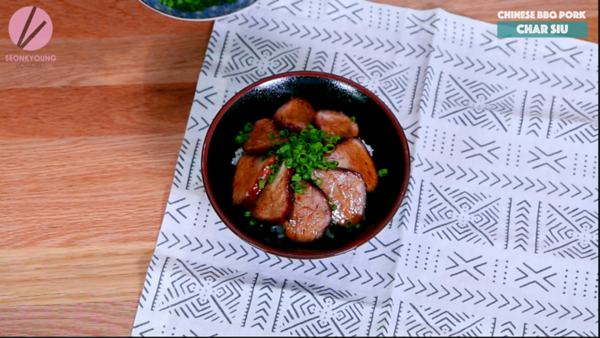 Just top the char siu on your favorite greens and serve with your favorite dressing! 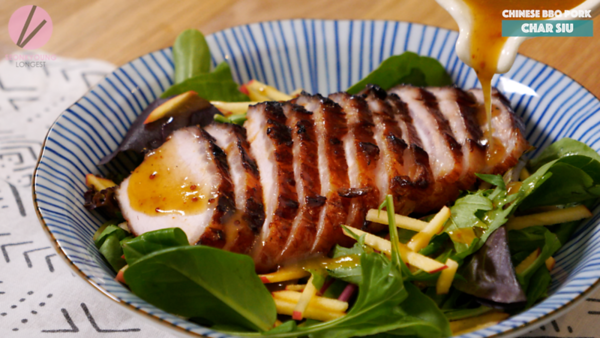 My favorite dressing for this Char Siu salad is my ginger dressing and oriental dressing! Hope you guys try this recipe at home!!! 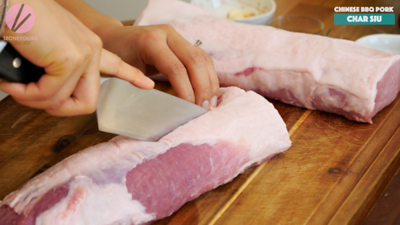 Cut the pork loin in half in lengthwise and place in a baking dish or plastic bag. 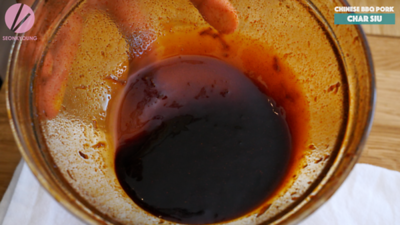 Combine all ingredients for marinade and whisk well until honey is completely dissolved. 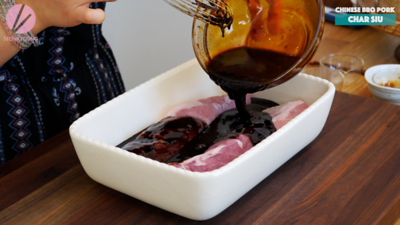 Pour the ¾ of the marinade into the pork and move the pork around so it will sit in marinade evenly. Let it marinade at least 6 hours to 48 hours. 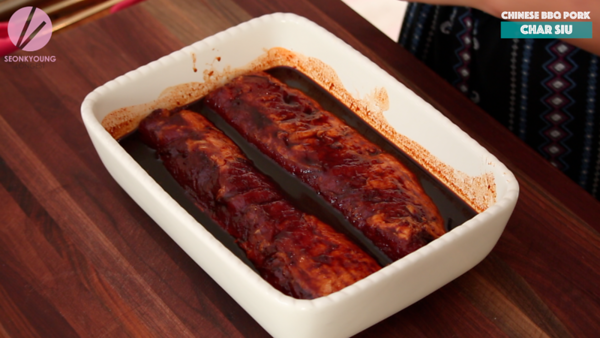 Place the marinated pork on top of the prepared baking pan. Broil the pork on the lowest rack of the oven for 10 to 12 minutes. 12 minutes up, now brush the glaze on the pork and flip it over. Glaze the other side too and broil another 10 to 12 minutes. 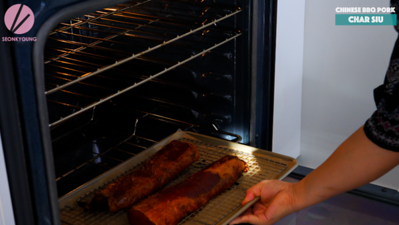 Brush the glaze once again and place the pork on the highest rack of the oven (closest to the broil) and let it caramelize for 2 to 3 minutes or until the inner temperature of the pork reaches to 145F. Remove from the broil and let it rest for 3 minutes. Brush with only honey for the extra shiny look and it’s done! I just became introduced to your food through FB of all places. Lol My family is Muslim, so we dont eat pork. Is there any way that I can make this with chicken? Can dark meat chicken be prepared in the same way? Yes! 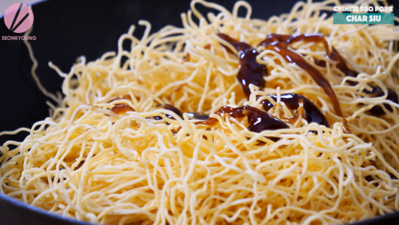 You can make this with chicken! For chicken, everything will be same, but cook it until the meat temperate reach 165f! Coincidentally I was walking through the clearance section at our grocery store, one of my favorite sections to kind of force myself to think of things to cook, and I saw a pork loin for real cheap that I decided to grab despite not knowing what to use it for so really glad I came across this recipe! Question, my broiler is actually in the lower drawer portion of my oven instead of up top. Is there a way you would recommend attempting to make this recipe with that in mind? I was thinking I would have to treat it like a regular roast and cook it through in the oven and then finish it off underneath the broiler but wasn’t sure how this might affect the recipe or really the lengths of time I will need to take into consideration. Thank you so much for responding! Ive been very busy so i apologize for the late response. Today is a slow day for me so im going to try out this homemade ramen. 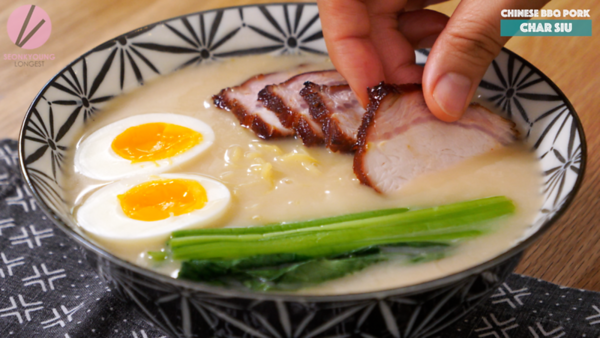 I really appreciate your efforts to give us this recipe because id like to make my own ramen recipe but havent had any decent bases to start with. I just made this for the first time and it is so awesome. It was easy so easy to make. Than you!!!! Hi! I love your recipes and follow you on IG. I just moved to a new house that has a gas stove and the broiler is at the bottom. How would you suggest I broil this? On the low broil option?